A Vision Shared: A Classic Portrait of America and Its People: 1935-1943. Published by St. Martins Press in 1976. 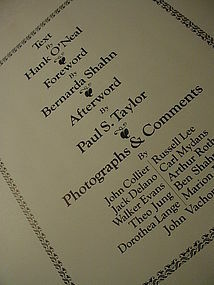 Text by Hank O'Neal, photos by Dorothea Lange, Walker Evans etc... This hard cover coffee table book is tight and clean however the dust jacket is tattered. A small stain is also at the bottom of the front beige linen board. Wonderful B&W photos that capture that period in time.